Meanwhile back at the house... things are definitely moving on the master bathroom front. Can you even recall when I first knew we had to go in and fix this 80/90s redo? I'm ashamed to say that after we made an offer on the house we walked through with the engineer and sought his advice about the crack in the terrazzo shower base; he thought we could probably get a replacement installed for $1000. Well, dear readers that was April 2004. Rather than start to repair what would eventually be ripped out we put it on the "to do" list and moved on to more urgent projects like the roof, the windows and the pesky termite damage. We were going to rehab the room in 2006, we even started the demolition, then we had the water gushing through the ceiling scenario that made us switch focus and fix up the boys' bath. Remember? That was the "practice" bathroom. We practiced some more in the girls' bath and the downstairs bath and perfected our design skills in the powder room. Before long I realised I had perfected them so impeccably I'd run right out of inspiration. 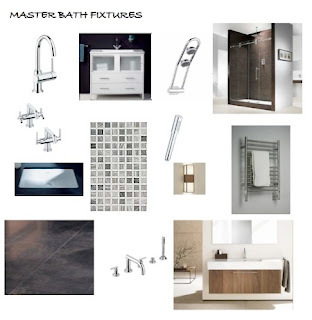 For the last couple of years I've been seriously collecting images of spaces and products I love: wooden tubs, showers and over-the-top tiles. I loved them all - just not in that room with its design challenges: no natural light, raised floor and a small footprint. Nothing felt completely right, so we waited. Then we went to Palm Springs. The hotel bath was the usual windowless space but it had a ton of light - sconces, lights on either side of the mirror and six energy-saving hi-hats - in a space that had the exact dimensions of our master. When I got home I pulled out my favorite photos (I'm not sure where they came from so if I've ripped one of your designs I apologise) and saw they all had something in common: dark vanities. The same dark vanities we'd used in all the other bathrooms. I'd been trying to avoid them here to increase the feeling of space but I realised going lighter wasn't going to help and I should just go with what's worked in the other baths. From there it all just fell into place. So that's it - five years of procrastination, a blog full of inspiration and a few days in a hotel in the desert - we are finally ready to roll. This is amazing - I do exactly the same thing! I collect photos of stuff I like, arrange them room by room in a scrap-book like sheet, try this item, then another, add texture and color, until it all "clicks". Funny! 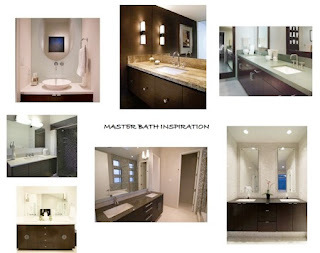 I'm loving your quest to master the master bath. It's so great when that sort of aha moment occurs. Good for you. We look forward to the updates. Are you still planning for the cold storage medicine cabinet?